Synthetic peptide within Human MBNL2 aa 260-290 (C terminal) conjugated to Keyhole Limpet Haemocyanin (KLH). The exact sequence is proprietary. HeLa cell lysate, Human liver tissue, HeLa cells. ab171551 is purified through a protein A column, followed by peptide affinity purification. Our Abpromise guarantee covers the use of ab171551 in the following tested applications. WB 1/100 - 1/500. Predicted molecular weight: 41 kDa. Mediates pre-mRNA alternative splicing regulation. Acts either as activator or repressor of splicing on specific pre-mRNA targets. Inhibits cardiac troponin-T (TNNT2) pre-mRNA exon inclusion but induces insulin receptor (IR) pre-mRNA exon inclusion in muscle. Antagonizes the alternative splicing activity pattern of CELF proteins. RNA-binding protein that binds to 5'ACACCC-3' core sequence, termed zipcode, within the 3'UTR of ITGA3. Binds to CUG triplet repeat expansion in myotonic dystrophy muscle cells by sequestering the target RNAs. Seems to regulate expression and localization of ITGA3 by transporting it from the nucleus to cytoplasm at adhesion plaques. May play a role in myotonic dystrophy pathophysiology (DM). Nucleus. Cytoplasm. Greater concentration in the nucleus. Expressed in or near large cytoplasmic adhesion plaques (PubMed:16273094). Location in the cytoplasm is microtubule-dependent (PubMed:16273094). In both DM1 and DM2 patients, colocalizes with nuclear foci of retained expanded-repeat transcripts (PubMed:11929853). 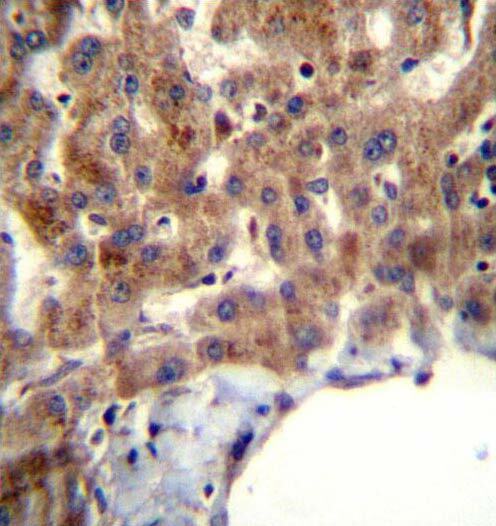 Immunohistochemical analysis of paraffin-embedded Human liver tissue, labeling MBNL2 with ab171551 at 1/10 dilution. IHC was followed by peroxidase treatment. 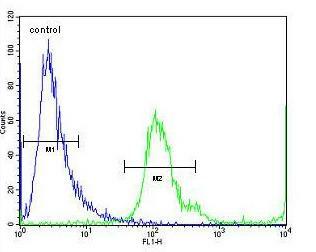 Flow cytometric analysis of HeLa cells (right histogram; green), compared with negative control cells (left histogram; blue), labeling MBNL2 11 with ab171551 at 1/10 dilution. Publishing research using ab171551? Please let us know so that we can cite the reference in this datasheet. There are currently no Customer reviews or Questions for ab171551.